When sixteen-year-old Eva Bontrager wakes up in an operating room seconds before a procedure to harvest her organs begins, she’s proclaimed a medical miracle. As she begins the uncertain path to recovery from the brain hemorrhage she suffered after a riding accident, her family is thrilled and Eva is happy to be alive. However, it quickly becomes apparent that something is different. Eva is different, and now Peggy Bontrager, Eva’s mother, struggles to adapt to the child she has now versus the one who fit seamlessly into their happy lives before her daughter was pronounced brain dead. Reese Connelly is dead. She, along with a handful of others, including a child named Jilly who is too young to have words, are trapped in the cemetery in which they were laid to rest. Unable to cross over, the inhabitants of the graveyard spend their restless lives speculating about why they are stuck while others who arrive at the graveyard continue on to an unknown fate. They pick at each other’s wounds, digging into their personal failures and closely guarded secrets until one day their shadowy world is invaded by a road construction project. As Jilly wails, the oblivious road crew unearths the skeleton of a child in a ditch, and a stranger’s final terrifying act will set the worlds of the living and the dead on a collision course that could release or destroy them all. 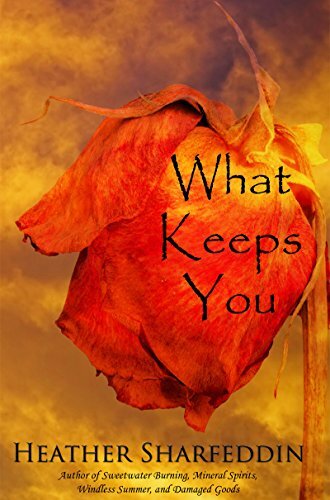 What Keeps You is a story about living, dying, and the difficult journey toward acceptance and letting go. &copy; 2019 Heather Sharfeddin All Rights Reserved.